Each player will receive a trophy. So all you Pars fans can choose which player you thought performed best in the season 2002-2003. Here is your chance to name your Internet Player of the Year and Young Player of the Year for Dunfermline Athletic 2002 - 2003. We will present each winner with a trophy inscribed "Internet Fans Player of the Year 2002-2003". To enter select your choice of Player and Young player from the list below. The winner will be the one with the most votes. ALSO we have a Competition with a prize (details to follow). To enter you must answer the question and fill in your contact details. 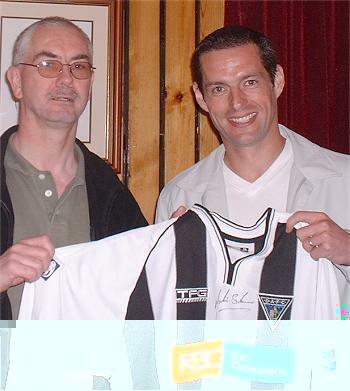 Justin Skinner presenting his signed shirt to DAFC.net, for sponsoring him last season 2001-2002 which was given out last year. Which two strikers previously (to season 2002-2003)held the top scoring record for Dunfermline in the Premier League ?